Few things please me more than to use something I already have on hand in a fresh way to create something beautiful, so when I saw an idea a few years back in Southern Living for a completely ingenious new way to dress up ho-hum terracotta pots, I was totally on board. The concept is simple: take three standard pots – one large, one medium, and one small – and nestle them within one another in a way to create a planter that is as impressive as it is cost-effective. You just can’t beat that with a stick! 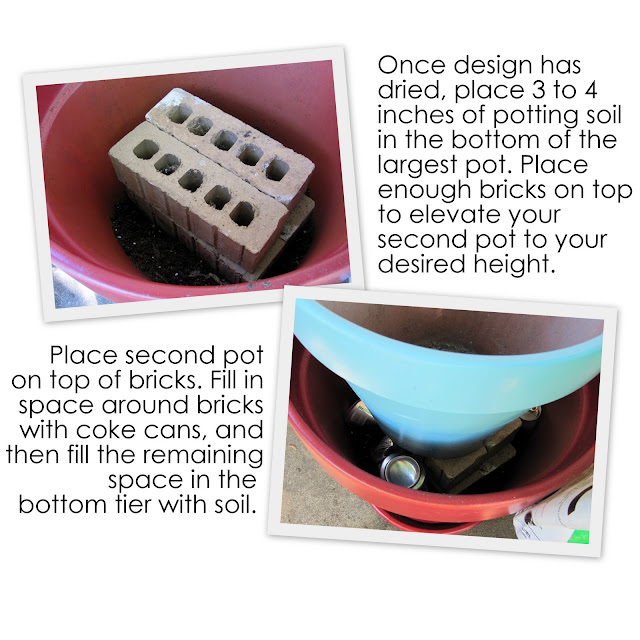 I have been implementing the same idea since I first came across it all those years ago, and I’m going to share with you today exactly how I build my planter each year. This year, I decided to dress things up a bit by painting the pots in vibrant red and turquoise (my current favorite color combination) and then stenciling our street number onto the largest pot. I am so pleased with the finished result! When choosing flowers to fill your pot, gardening experts recommend striving for plants to fit each of three descriptions: a thriller (something dynamic that immediately draws in the eye), a spiller (something that will trail down the side of the pot to add visual interest and anchor your design) and a filler (a flower variety to fill the space with lots of yummy color). In my planter this year, I chose Dracaena (a spiky plant – my thriller), Margarita Sweet Potato Vines (my spillers), and Diamond Frost and Petunias in red and white (fillers). 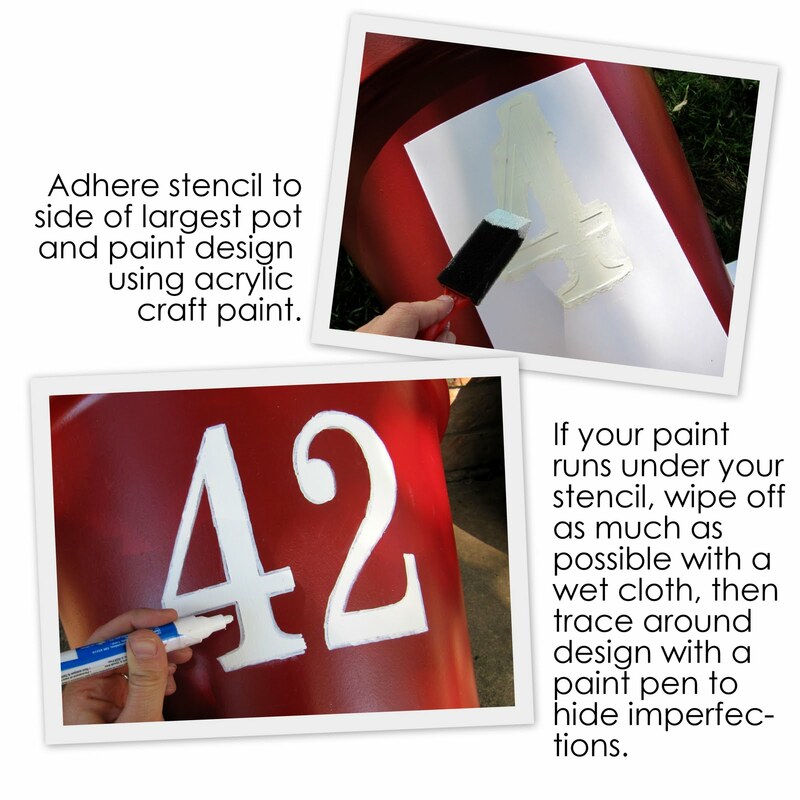 Don’t remove your stencil until your design has had the opportunity to dry completely. Look to buy the pots when they are on sale to make this project especially budget-friendly. I purchased mine a couple of years ago from Garden Ridge at half off. I recommend filling the bottommost space of any pot with crushed Coke cans to ensure proper drainage and so that the planter doesn’t become excessively heavy (and thus more difficult to move around). As long as you leave at least 10 inches or so of soil to fill the top portion of the pot, that will be enough space to allow for adequate root development. Please take a moment to check out these marvelous parties where I’ll be sharing this project! What a fun planter! I love the colors you chose too! I was so intrigued by your sneak peek of this project last week! I love it! I’m so going to make one of these for my patio. I went all the way to Making The World Cuter to find a neighbor! I’m in NLR! I remember this in SL, too. I have it in my idea book! Very cute with the funky color and numbers – great job! Happy to find you out here. Have a blessed week! Nice character ~ love the colors too. I can’t wait to try this. It is so beautiful with all those flowers! I am following from Friday Follow. Come visit me and enter my drawing for the Mother’s Day basket. There is only 1 more hour in the drawing! This is such a great idea! 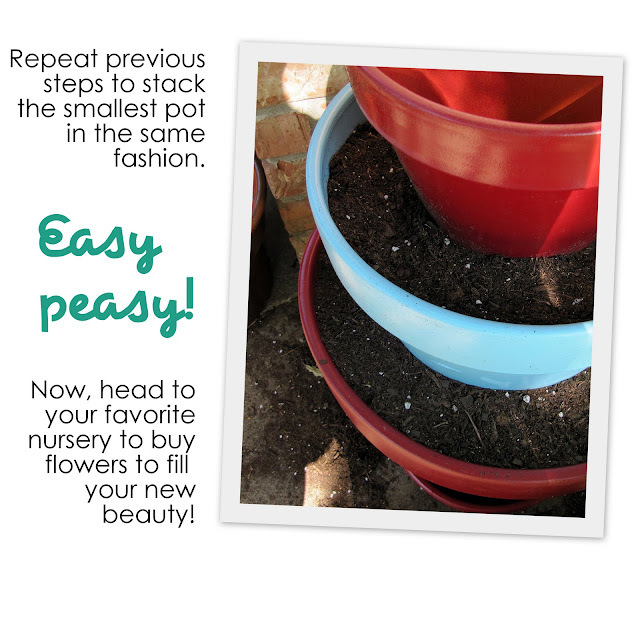 I just might have to try this with all the random pots I have laying around :)! This is a fabulous idea and I can’t wait to try it – we still have snow and that looks a little too heavy to haul inside for storms. I’ve heard the ‘thriller, spiller, filler’ rule before but when I’m standing at a nursery I never know which is which. Thanks for a brilliant idea. Found you from Making the World Cuter. I love this Amy! Thanks so much for sharing! I have plenty of pots to paint and do this with. Now, to just pick out my spray paint colors and my flowers. This looks so cool! At first I was just thinking I’d look but not be inspired to make, but wow! This is so cool and I think doable for our front door area. I was needing something to “dress it up” a bit. Thanks for the great idea. This is so, so, so cute!! I love this!!! What a cute idea and so creative. thanks for sharing. Link up to my We Can Do It Cheaper parties on Thursdays. I would love to have some of “my” followers see the stuff you do. My mom just sent me over here and I’m loving it so far. Hi! LOVE this idea!! Found you on Blog Frog and I’m so glad that I decided to peek at your blog because I’m your newest follower!! I can’t wait to do this for my sister-in-law; she’d love it too! Thanks so much for sharing! 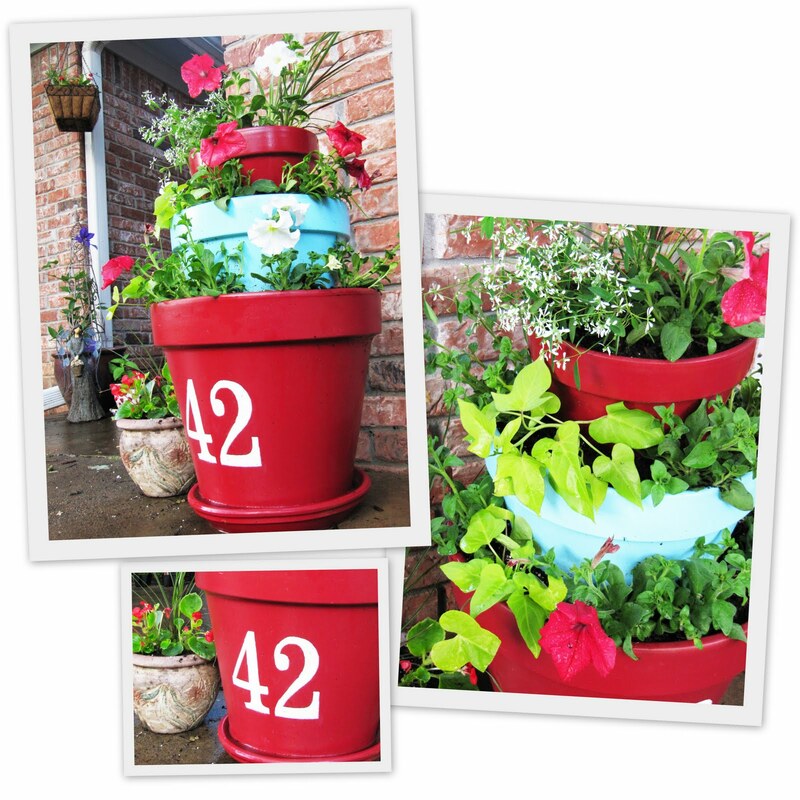 I just love your flower pots and am now following your blog..lots of great creative posts. Hi Amy! Love it, what a great idea! It’s Katie from Katie’s Nesting Spot but I’m signed in as my educational blog. I’m working on a Mother’s Day idea post and I’ve included this in it. I used your 3 photo collage, gave a brief description, credited you, and provided a direct link to this post. I hope that was okay, but if it’s not let me know and I’ll remove it. Oh my gosh I love this!! So cute! I am going to have to make one for sure!! Thanks for adding one more thing to my list! Love this and the colors you put together are super cute! How can something so simple, be so genius! I love this and I have a stack of terra cotta pots waiting to be painted. Thanks for inspiring me, just in the nick of time! Oh. My. Word. Love this! I actually bought a set of pots to do something similar last summer. I never got around to finishing the project but I’m totally inspired and motivated now. This is FANTASTIC! Thank you for sharing. Now I am off to browse the rest of your blog! It is just beautiful and I am going to add it to my side bar 🙂 Thank you for the inspiration! Oh my this is too cute! And your pics are lovely great job!! I just blogged about these….I love them so much! I am in LOVE!!! This is a fantastic idea! I can’t wait to make a set. This is fantastic! I’ll be featuring it on my blog at the end of May! This is SO cute. Nice colors, too!! This is my first time at your blog, too, so I’m going to check out more, it looks so neat! Beautiful. And a great way to show your house number. i’m so in love with this,, the color combo is so pretty. Just might have to make one for Mothers day.. surely be something they dont already have. Thanks for sharing with us..
What a great idea! I love it! I’m a new follower! Such a cute blog! Thanks for sharing! Those are adorable! I am going to feature them on my blog tomorrow!! I love this! Something like this would be a perfect addition for my patio garden! Wow, the colored pots really add to the display! Well done! Thanks for sharing…I’ve posted a link. this idea is amazing” I especially like the colors that you chose. Just wanted to let you know that I featured this, this week. This is absolutely a-d-o-r-a-b-l-e!!!! Thanks for sharing!!! I must make this to put on my revamped front porch! Just found you through A Soft Place to Land. Love these pots. I may have to make some for my front porch. I made the hop over here from Fireflies and Jellybeans (I’m the wall in the feature), and I hafta HAFTA do this! Your tutorial is great by the way. I love this! It’s on my to-make list; thanks for the wonderful how-to! Just fabulous! I really love your color combo, one of my faves too! Will definitely give this a try. 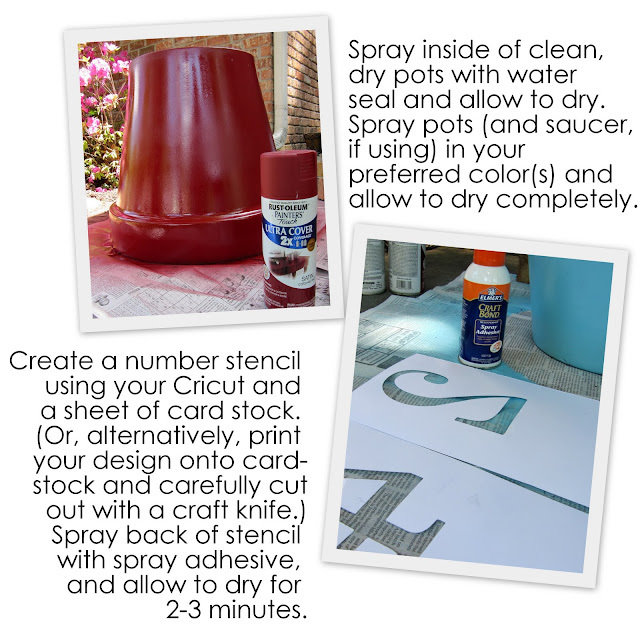 I am sooo wanting to do the numbers on the clay pots. I am going to give some away for Christmas. However, the tower is very fabulous!! Need one for my front porch! Found you from girl and a glue gun- can’t wait to check out your other projects and see what you do in the future!! Thanks for the inspiration! Wow, this is gorgeous! I’ll definitely be doing this sometime this week. And I would love to link to this if you didn’t mind. I absolutely LOVE this and I cannot wait to try this myself! Thank you for sharing your Tutorial with us….Can I ask what the names of the colors of spray paint are that you chose to use? I LOVE those colors…. Thank you so much for sharing this fabulous tutorial! I’ve been so tempted to buy one of those re-barb poles to stack the tilted pots on, but they are $25! This is a much more cost-effective solution. I especially love how you painted them. What a wonderful tutorial! I love that planter ~ going to the store to buy the materials after the kids are out of school! And, going to have to grab your button for my blogs! Thanks for sharing it! Thanks so much for sharing such a cute idea. I love the blogging world for this reason. We posted a link on our blog. Love this!! I out to hunt for some pots that will work- I have a ton! Hey it’s Sam and Andrea from Crafty Batches and we are awarding you the Gorgeous Blogger Award! Please visit our site to see all the details and to pass it along to your favorite blogs! Love the looks of this ! I made this and I’m blogging it tomorrow, giving you credit of course! Pop by and see how I did. Hi! I just finished looking at Brandy’s Tiered planter and she mentioned that yours was her inspiration, so I thought I would come and see yours too! I love the colors that you chose! !1 Thanks for the tips on how to plant in them. I made a “Tipsy” tiered planter a while back and choosing the right plants was the hardest part for me! When you have a minute, please stop by and have a look at mine! I love this! I can’t wait to make one for our new house! I am featuring you on my Friday Favorites this week! I don’t know if anyone else from over the pond has made one, but your idea has travelled all the way over to a wee village in Scotland ! Here’s my take on it – maybe not as classy as yours, but still as much fun! Now all we need is to keep the sunshine and perhaps the plants will grow! Lovely ! just the thing I need to perk up my front porch ! My husband is a travel nurse and works contracts about 13 weeks at a time all over the country. We travel and live in a large RV. The lot numbers are oftentimes not very evident, so this is a good way to change up our “address” fairly often. I’ll just have to use greenery that will withstand the cold for winter filler, with picks or other decorations for color. I love this!! We are having a new patio poured next week and as soon as it’s done I intend to copy this. Love this! The colors are fantastic! Petunias + 42. Is this a Hitchhiker’s Guide to the Galaxy reference? Hahaha. Oh man, this is awesome. It just might be exactly what I need for my very boring planters in front of my garage. I want more height and with your wonderful tutorial, I think I know what to do now. Just curious why you spray water sealer on the inside of the pots? Is this to prevent them from molding, as this is what I hate about terra cotta pots. Your colors are fabulous, and I just live this idea so very much. Thanks a bunch for sharing. !!! Hi Amy! Just found your blog and i am in love with this project! I just featured you in conjunction with Home Depot’s Black Friday sale– headed out to get my supplies for this right now. Pop over if you can! Love this and can’t wait to do it!! Thanks for the fantabulous inspiration! LOVE THIS!!! I’m going to make one of these for my front porch this summer! I featured this on my friday favorites! Super Cool! Love it! Want one! Shared on my facebook page! What were the sizes of the pots you used? Thanks for the great idea! Mine’s finally finished in hot pink and lime green with white and pink flowers and bright green plants! Love it! Thanks!! this looks like a fun project. I do have two questions. Love this idea. Very nice looking. Thanks for sharing. I can’t wait to make this, thank you for sharing. Originally found it through pinterest. It looks so good and ready for spring. I love the colors you used. And the tips on what flowers to use was great, thank you for sharing! Oh my gosh Amy! You live in Conway? My daughter loves gardening and just lives up the road in Mayflower. Her husband is a “Master Gardener” and I’m hearing your weather this morning is beautiful. My daughter just sent a darling picture of a lovely light green Lunar Moth. It was resting this Spring morning on her window pane and looked like it was a stained -glass window. So glad I was looking for your planters and love them. Great idea! Thanks for giving me a weekend project! Now, to plan my pots! Yiiipeee! I hope it’s okay, because mine turned out fabulous & I can’t thank you enough for the terrific idea! This is absolutely lovely!! Thank you so much for sharing and for the wonderful step-by-step! After reading your post, I decided to try making one for my Mom for Mother’s Day, she absolutely LOVED it!! Thank you so much for the inspiration!!! and will be sure to share your site. Thanks a bunch! These are really amazing! I don’t know how I haven’t stumbled across your blog yet, but now that I’m here I can’t wait to read through your ideas 🙂 Thanks for sharing these! I love the colors! Bright and they make me want it to be spring NOW. I can’t wait to do this project. I love this. I was wondering what size your pots are? I love the size of these. But don’t want to waste money on guessing the right size when you have the size perfect. :).